As you might have read in the last post I spent some time in Tuscany at the end of September. 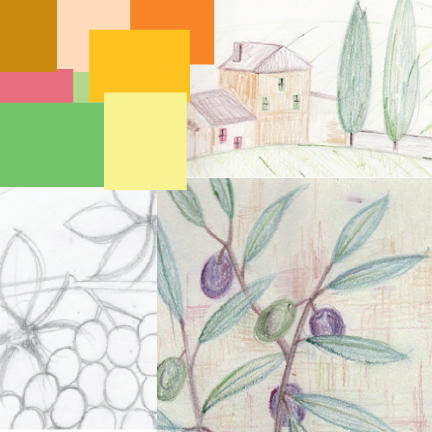 With all the inspiration for decorative design in Italy, I was thinking of a Tuscan collection while traveling. So how does one start the process? I purchased some research (did not have time to draw on location) took photos, and starting sketching in my studio as soon as I was home. Although I chose some local colors I wanted to expand a bit on the typical earth tone and make the collection a little brighter. The first drawings were in colored pencil, they were then scanned into my computer and opened in Illustrator. Although the subject matter is typical of the region rendering the pieces digitally gave them a contemporary look. The collage below represent part of the evolution of the group. It’s been fun. The art work will be shown in my portfolio at the the Gift Show in Atlanta in January.